Carmelo Anthony said Tuesday he lost his cool after Kevin Garnett said things to him that he feels shouldn't be said to "another man." "There's certain things that you just don't say to men, another man," Anthony said. "I felt like we crossed a line, but like I said, we both had an understanding right now, we handled it the way we handled it. Nobody needs to know what was said behind closed doors, so that situation was handled." The All-Star forwards exchanged words during the game and Anthony clearly was affected. He shot 6 of 26, seeming at times in the second half to be most concerned with pushing and shoving Garnett, and acknowledged Tuesday that he "allowed some negativity to come into my circle." "Nothing happened for me to be suspended," he said. "I wanted to talk to KG. I think it was something we both needed to get off our chest and see what really the problem was. No altercations, it was just some words and a conversation that we needed to have." Anthony and Garnett had both received technical fouls with 9:03 remaining in the game after some physical play followed by jawing back and forth from the baseline to midcourt. After the Knicks' 102-96 loss, Anthony went the wrong direction toward the Celtics' locker room in hopes of finding Garnett. "It's over with for me. Whatever happened last night, happened. 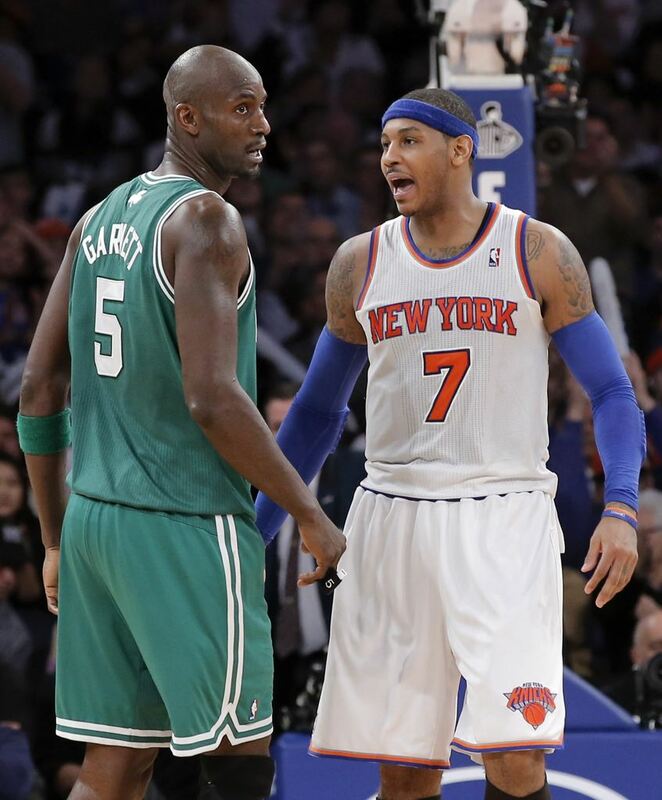 The words that was being said between me and Garnett, it happened, can't take that away," Anthony said. "I lost my cool yesterday, I accept that, but there's just certain things that push certain people's buttons." Anthony has been called for eight technical fouls, one off the league lead, and was thrown out of a physical loss against Chicago after he picked up two. Anthony was once suspended 15 games by the NBA for punching former Knicks guard Mardy Collins in the face during a brawl while playing for Denver, and the Knicks need their leading scorer and the reigning Eastern Conference player of the week to walk away rather than be baited into exchanges. "We've sat down and we've talked about it," Knicks coach Mike Woodson said. "Listen, Melo's been playing at a high level and Melo likes winning. He's tasted that here and he's a big part of why we're winning and hey, he just can't have slippage like that." The Knicks' next game is Thursday at Indiana.